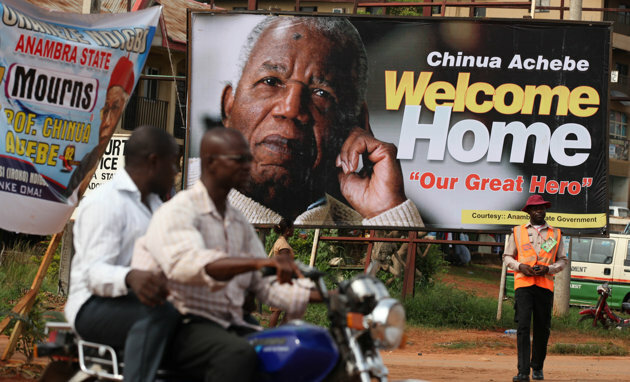 Writer Chinua Achebe is being remembered in Nigeria as a fearless writer who bowed to no political pressure. Mourners gathered in his hometown for a funeral Thursday in Ogidi, a small town in Nigeria's east. Among attendees was Nigerian President Goodluck Jonathan, who held up copies of Achebe's books during the service at a local Anglican church - including his famous essay "The Trouble With Nigeria." Ghanaian President John Mahama also attended alongside Jonathan. Achebe's family will bury him in a mausoleum next to his home in Ogidi later Thursday. Achebe died at age 82 in March after living much of his later life in the United States. He is the author of 1958 classic novel "Things Fall Apart," as well as other works.